This is a special headphone case of the failure product listing. It has been bought at least 6 years ago with the scope to be used with our television that is 3-4 meters far as its cable is really log , very logs about 5 meters! The sound is very bad. tested with the Carrefour earbuds/EAR 23 (here is as a reference ). the sound level is same as with these earphones . But they sounded quite bad : they lack soem bass (as shifted upwards ) little treble and sound as plastic. 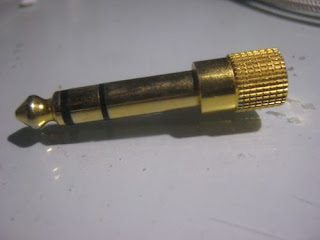 I think that the oly of value for these earphones is .... the adapter !!!! You normally cannot find easily this type of adapters. The main base /socket is too short from the similar adapters and very good for using it to my R75 ICOM receiver !! Αναρτήθηκε από Zach Liang στις 1:53 π.μ. AIWA JX704 cassete recorder player!